Today's So Shoe Me is the Aggy LTT Boot by Dr. Martens X Agyness Deyn, $240, available at Solestruck. 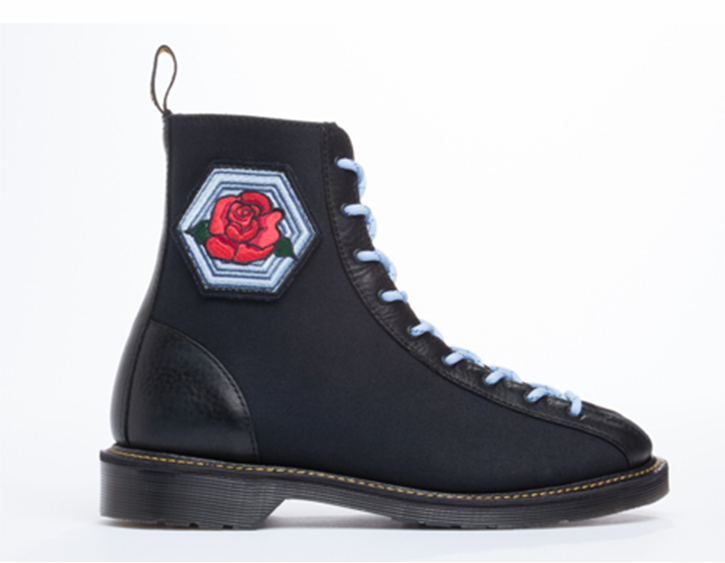 Tatoo my soles with these vibrant rose accented boots by Dr. Martens X Agyness Deyn. Traditional details like the rose applique patch and black upper offer a timeless style that can be worn all year round. Baby blue accents add a signature pick-me-up to these almost all-black boots. The iconic yellow stitching lets you know you have on some original Dr. Martens and the tough leather and canvas upper make them perfect for music fests and more this summer. Pair these lace-up boots with a vintage tee and delicate cream shorts for a mix of hard and soft this festival season. So Shoe Me a pair of rock n' rose boots that will add a traditional twist to my cutoffs and tees this summer.